No group offerings currently scheduled, but we are making Adirondack chairs regularly through 1-on-1 Private Instruction! Email us if interested in either private lessons or to be notified next time group class dates are offered! Duration: 12 hours in group class. Approximately 7 hours +/- as Private Instruction. 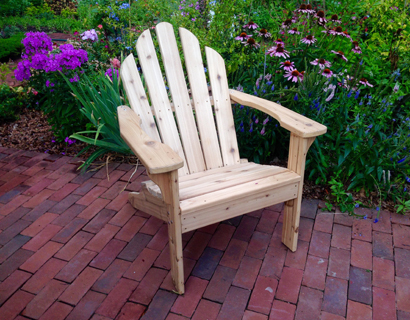 Class Description: The Adirondack chair is virtually synonymous with rest and relaxation! Make your very own to enjoy in or out of doors in just a few quick sessions. Made from premium cedar, these Adirondack chairs are built to look beautiful and to last for decades! Neither experience nor any prerequisites are required. In this class, you’ll use industrial grade tools including mitersaws, bandsaws, router tables and spindle sanders. This class is 100% for beginners and we know you’ll love both the experience and the finished project. We will happily share our plans for this great project with you so that you can build as many more as you like – perfect for gifts or relaxing on your patio with a special someone. Register today! The Adirondack Ottoman: We offer a gorgeous, matching ottoman that you can come back and make with us in a 60-90 min private instruction lesson. It is designed to fit perfectly with our chair and has been tested and refined for maximum comfort! Call us today at 267-331-5880 to schedule a time.